The grands magasins can be terrific places to spend a weekday. Most of them have restaurants and cafés, gourmet food stores, beauty salons, free public toilets (!) and all of the usual departments that could take a day to properly explore. If leisurely browsing is your style, then we recommend avoiding them during weekends and the sales! Speaking of sales (fr. les soldes), these semi-annual events can be a fortuitous time to visit Paris: designer clothing at astonishing discounts  prices slashed up to 80%. Sales are state-regulated in France and generally span six weeks, starting in early January and again at the end of June. It is usually during the second price-markdowns, about midway through the sales season, when the best values can be found. 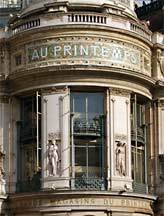 We should not neglect to mention that the large department stores are among the few businesses in Paris (along with several modern cinemas) that offer a cool air-conditioned refuge during the occasional hot spells of summer! Visitors who survived the record heat-wave of August 2003 will appreciate the concept of lowering one's core body temperature this way. Non-EU residents may qualify for a 12% tax refund on purchases of over €175 made on the same day; see the Customer Service desk for a détaxe form. In addition, Printemps offers non-residents a 10% discount card which can be printed online from their web site. If you know of an error in our listings below, or a store which is no longer in operation, we would greatly appreciate if you could report it here. Thank you! NOTE: The closest Métro and/or RER stop is provided for each store in this directory. To view street maps of the area around each station, click on the red icon. 64, boulevard Haussmann, 75009 Paris. Phone: 01.42.82.50.00. Open Mon. - Sat., 9:35 a.m. - 7:00 p.m.; Thurs. until 10:00 p.m.; closed Sun. Parking: Mon. - Sat., 7:30 a.m. - 9:30 p.m.; Thurs. until 11 p.m. Entrance #1 at corner of blvd Haussmann & rue de Charras; #2 at corner of rue du Havre & rue de Provence. Havre-Caumartin (lines 3, 9), Opéra (lines 3, 7, 8); RER-A: Auber; RER-E: Haussmann St-Lazare. Other stores in Paris: Italie - 30, av. d'Italie, 13e, 01.40.78.17.17 ; Nation - 21, cours de Vincennes, 20e, 01.43.71.12.41. Between the Opéra and the Gare St-Lazare, this most Parisian of department stores has  besides the traditional offerings of fashion, home decor, domestic arts  an extraordinary cosmetics department with a fabulous selection of perfumes & beauty products, and advisors who will guide you in your quest. For the utmost in convenience, a number of other services are at your disposal: hair salon, children's nursery, post office, travel agency, and several restaurants  Ladurée, Brasserie Flo, La Terrasse, Le Café Littéraire (in the book department). Free fashion shows are held under the 1920s glass dome on Tuesdays (all year) and Fridays (Mar.-Oct.) at 10 a.m. on the 7th floor. 52/64, rue de Rivoli, 75004 Paris. Phone: 01.42.74.90.00 ; Fax: 01.42.74.96.79. Open Mon. - Sat., 9:30 a.m. - 7:30 p.m., Wed. until 9:00 p.m.; closed Sun. Parking: 700 spaces at 4, rue Lobau; 200 spaces at 6, place Baudoyer. Hôtel de Ville (lines 1, 11); Bus lines: 69, 70, 72, 75, 76, 96. BHV in the suburbs: 119, boulevard Paul Vaillant Couturier, 94200 Ivry-sur-Seine. Phone: 01.49.60.44.10 ; Fax: 01.49.60.44.12. In the heart of historical Paris, the BHV boasts 8 levels of merchandise, including fashion (minimal), home decor, household linens, furniture, electric household appliances... and its most dazzling highlight: a hardware department with 365 vendors and a good hundred salesmen. BHV is a brand of the retail conglomerate Groupe Galeries Lafayette, which also owns Monoprix. 24, rue de Sèvres, 75007 Paris. Phone: 01.44.39.80.00 ; Fax : 01.44.39.80.50. Open Mon. - Wed., 10:00 a.m. - 7:30 p.m.; Thurs. 10:00 a.m. - 9:00 p.m.; Fri. 10:00 a.m. - 8:00 p.m.; Sat. 9:30 a.m. - 8:00 p.m.; closed Sun. Parking: square de Boucicault (across from store). Situated in the heart of the Left Bank, founded in 1838 by Aristide Boucicaut, Le Bon Marché combines old-world tradition and modernity in a very Parisian top-of-the-line store. Man, woman and child are equally well-served: clothing, linens, housewares, sporting goods, a large grocery store (38, rue de Sèvres), antique dealers, restaurants... covering 32,000 square meters (344,320 sq. feet) on 5 levels. Le Bon Marché is a brand of the French conglomerate LVMH, which also owns the currently closed La Samaritaine. 49, boulevard Haussmann, 75009 Paris. Phone: 01.53.30.89.33 ; Fax: 01.42.66.17.95. Open Mon. - Fri., 9:30 a.m. - 8:00 p.m., Thurs. until 9:00 p.m.; Sat. 9:30 a.m. - 7:30 p.m.; closed Sun. Other stores in Paris: 126, rue de Rivoli, 75001, 01.53.40.93.23. First opened in 1861 by Clemens and August (C&A) Brenninkmeijer with a warehouse in Holland, this was one of the first retailers to make good ready-to-wear clothes available to ordinary people at an affordable price. Other family members founded C&A companies in Germany, England, and Belgium during the following century. In 1972, C&A opened in France; since that time, more locations have been built in Switzerland, Luxembourg, Spain, Austria, Portugal, and Denmark. Their formula is to offer the best quality fashion clothing at the most competitive prices, across a wide range of merchandise  high fashion items or just basics  to meet the many different needs and tastes of customers. 136, rue de Rennes, 75006 Paris. Phone: 01.49.54.30.00. Open Mon. - Sat., 10:00 a.m. - 7:30 p.m.; closed Sun. Saint-Placide (line 4), Rennes (line 12). Other location in Paris: 71, boulevard Saint-Germain, 75005, 01.44.41.31.50, M. Odéon (lines 4, 10). With dozens of locations throughout France, Fnac offers an excellent selection of books, music CDs, video tapes & DVDs, software, computers, photo and audio/video equipment. Visitors should be prepared for sticker shock, but if you must find some French music to bring back home, this is one of the best places to shop. Fnac also carries the absolute best selection of street and transportation maps for Paris and the suburbs, including the "Atlas Blay Foldex: Tout Paris par arrondissement" (about €6) which we like. Formerly at 80, rue de Passy, 75016 Paris. Phone: no longer in service. NOTE: Franck et Fils CLOSED PERMANENTLY on 2 July 2016. La Muette (line 9); RER-C: Boulainvilliers; Bus lines: 22, 32, 52. Founded in 1897 as "Les Galeries Parisiennes" by Emma Franck, an 18-year-old girl from Alsace, the store quickly became a success by creating custom fashions at the forefront of elegance, delivering orders within 24 hours from its on-site workshop. Her son Georges joined the business after World War I, and introduced ready-to-wear styles in the 1960s. Following generations of Francks have continued the business by adapting to changing trends in fashion. Franck & Fils joined the LVMH group in 1994, and added a men's wear department in 2008. 40, boulevard Haussmann, 75009 Paris. Phone: 01.42.82.34.56 ; Fax: 01.42.82.30.51. Open Mon. - Sat., 9:30 a.m. - 8:00 p.m.; Thurs. until 9:00 p.m.; closed Sun. Parking: Galeries Lafayette (entrance on blvd Haussmann). Chaussée-d'Antin (lines 7, 9), Opéra (lines 3, 7, 8), Havre-Caumartin (lines 3, 9); RER-A: Auber; RER-E: Haussmann St-Lazare. Other location in Paris: Montparnasse - 22, rue du Départ, 15e, 01.45.38.52.87. In the heart of the Opera district, this department store is the city's veritable fashion capital, carrying nearly 80,000 different labels within its 6 floors and 3 stores, as well as the most prestigious brands of cosmetics, accessories and culinary arts. Under its neo-Byzantine cupola resides the world's largest perfumery. In the fashion department, all the famous designers and dressmakers have set up shop; free 30-minute fashion shows are held every Friday at 3 p.m. (call 01.42.82.36.40 or e-mail for reservations). Your little ones will be elated with a huge selection in the Toys & Games department. A multitude of ancillary services will cater to anyone's needs (travel agency, beauty parlour, hair salon, restaurants, bridal & birth registries, florist, gift ideas, etc.). 95, boulevard de Sébastopol, 75002 Paris. Phone: 01.42.33.36.15 ; Fax: 01.42.21.91.10. Open Mon. - Sat., 9:00 a.m. - 10:00 p.m.; closed Sun. Réaumur Sébastopol (lines 3, 4). More stores: 24, boulevard Saint-Michel, 6e, 01.44.32.05.00. 50, rue de Rennes, 6e, 01.45.48.18.08. Toll-free customer service & general inquiries: 0 800 08 4000. Store hours may vary at other locations; some stores may be open on Sundays. This is where average Parisians go to purchase their everyday casual clothes, makeup, toothpaste, groceries, toys, and paper  inexpensive, a little of everything. Great for accessories and housewares as well; children's clothes are of surprisingly good quality. There are about 30 stores in the city, so you'll probably spot one from wherever you stand. However, you can always call the above toll-free number or visit the online store locator to find the nearest one. Patterned after the American Woolworth's stores of the late 19th century (1879), where products were sold at a fixed price (fr. prix unique), the concept was developed in France by the Nouvelles Galeries under the name of Uniprix in 1929, by Printemps as Prisunic in 1931, and finally as Monoprix by the Galeries Lafayette in 1932. Monoprix acquired the 132 Prisunic stores in 1997. 4, boulevard Rochechouart, 75018 Paris. Phone: 01.55.29.52.20. Open Mon. - Fri., 10:00 a.m. - 7:00 p.m.; Sat. 9:30 a.m. - 7:00 p.m.; closed Sun. Barbès Rochechouart (lines 2, 4). Branch locations: 19, rue de la Paix, 2e, 01.40.07.06.76 (and) 172/174, rue du Temple, 3e, 01.42.71.41.77 (and) 30, avenue d'Italie, 13e, 01.53.80.97.70 (and) 68, avenue du Maine, 14e, 01.56.80.06.80. This madhouse of a store is very much a local legend, originally created in 1949 by Jules Ouaki to cater to budget-conscious shoppers in this neighborhood heavily populated by immigrants. Be prepared for a near brawl over the huge bins of merchandise here, but odds are good you'll come across a strikingly inexpensive treasure that shouts Paris once you get it home. Now directed by Fabien Ouaki, the company also maintains 9 stores in the provinces, as well as several in the French colonies and internationally. Do you know of a great department store, market or Paris shopping resource we should list here? If so, please submit it! Images: Exterior detail of Au Printemps, by Tuscan Knox (photographer), from Wikimedia Commons. Interior view of Le Bon Marché, from Wikimedia Commons. Exterior view of BHV on rue de Rivoli, from Chic Shopping Paris, a blog by author Rebecca Perry Magniant. Exterior view of C&A Haussmann at night, © Corinne Dupeyrat (photographer), from Introduction to the Artist. See by Chloé fashion model, from Franck et Fils catalogue. Interior view of dome at Galeries Lafayette, © Gregory Kullberg (photographer), from Greg's Digital. Cookie and biscuit aisle at Monoprix, © Elisabeth Fourmont (photographer), from Ten French Stores That Make Me Happy, a blog page at GlamChic. Exterior of La Samaritaine (viewed from the Pont Neuf), by Daniel Lebée (photographer), © French Ministry of Culture and Communication. Exterior view of Tati, © Otto Buchegger (photographer), from EUxUS - Impressum. Store logos are registered trademarks of their respective companies. – All Rights Reserved.